We have been to the volcano, night and day, but we have yet to see any lava. The hot oozing deadly destructive molten stuff. The local news is reporting that the flow has reached the ocean. This is something we have to go see, options include a helicopter, a boat, or by foot. Our thoughts are to go by foot to allow us time to sit and admire the event. How far of a hike can it be? The flow is not in the Volcanoes National Park. Getting to the flow by foot has two approaches, from the national park side and from the county park side. 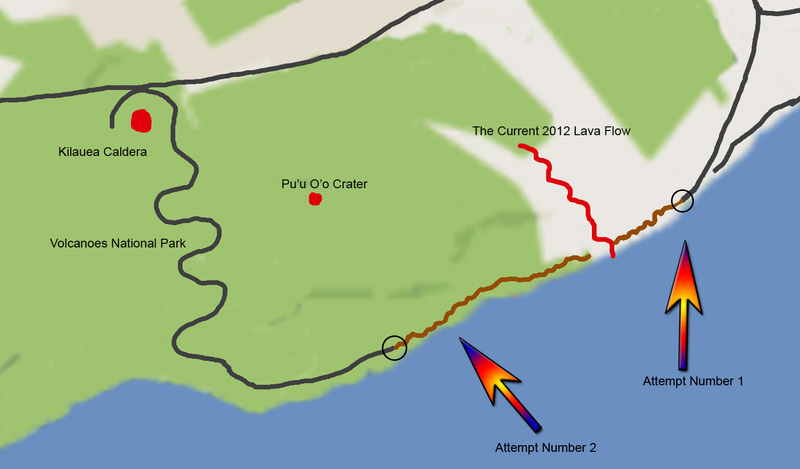 The county has a lava viewing park which is on the east side of the flow. With the flow being east of the national park and closer to the county park, the county park seems to be the easiest path. With a little research, we determined it is a 4 to 5 hour hike from the national park, and a 2 hour hike from the county park. Round trip or one way, hmmm, not sure. Off to the county park we go. We headed out a little late from Kailua. It's about a 3 hour drive to the county park. That is if you go directly there and don't take a couple of wrong turns. This park has strange hours, open from 2:00 p.m. to 10:00 p.m. The Lava View (or rather gasses from the lava). We get there at about 3:00 p.m. The plan is still in good shape. Hike to the flow in daylight, hike back in the dark. We load up our cameras, flashlights, extra batteries, and water; then head down the directed path. This path is an easy one-lane asphalt road laid on top of the lava. The park attendants (code for private security guards) tell us it is a short 10-minute walk to the viewing area. Hmmmm, that's okay, but we're headed beyond that and looking at the size of many people's backpacks so are they. Signs of private property and Civil Defense Area are posted on the road and along the trail. It is interesting to see the sporadic house precariously placed in the lava field. One of the houses standing in defiance. Night view of the caldera from Jaggar Museum. A couple of pictures and now what? ﻿﻿﻿﻿﻿﻿We'll head down to coast in the park to see what there is to see at night. We get to the turn around about 8:30 p.m.
We park. Might as well take a little walk, maybe just go as far as the pavement goes. Since it's a short walk, I dump half my water and only take the little camera. As we head beyond the parking area, we meet a young man who is also starting out. He says he is headed for the flow. I'm a little impressed. We walk with him for short time until his pace just out does ours. He is gone into the darkness, and quickly we can't see the light from his flashlight. It is amazing just how dark it is. No moon tonight, and we're conserving our flashlight batteries. We have three flashlights purchased for this adventure, and an extra set of batteries with us. Dark asphalt, dark black lava rock, and dark night, nothing to see. We stay on the road only because of the white markings on the side of the old road. When the white markings disappear under the black lava, we turn on a flashlight. We would have fallen over a waist-high pile of old lava flow if we hadn't had the flash lights. Okay, let's go a little further. We shine our lights forward and they hit a series of reflectors that have been placed along a path. Now, this is not a path that's been prepped in any other way. It's just a guided direction over the old flows. The rocks are sharp and at times sound like your walking on broken glass. Concentration on each step is required. Aaaand here we are at the sign "end of trail". Photo of trail at night! We've been blocked by an "end of trail" again, or have we. Up on the hill to the left, there is a flashing yellow light, like those used to control traffic in construction zones on the highway. Then looking down the perceived path, you can see another flashing yellow light. With a little effort, you can see three or four lights. Well the walk wasn't so bad so far, maybe we can hike to the lava flow, and off we go. The strange thing is the sound of the ocean; it is always forward and to right a little, but never directly to the right where it should be. We are hiking along the coast, but if you head for the sound, I don't think you would ever get to it. We made it to the first beacon. Not too bad. Occasionally a little disconcerting, as you go down into a gully or just not being on top of a hill, you lose sight of the beacons. Standing here at the first beacon I can't see the original starting beacon. Okay, another check to see if we want to continue, then off we go again. Using our phone with GPS, we figure we might be about a fourth of the way. An hour and a half in and we are on course. We made it to beacon two. Not as confident as before, we head off again for the flashing light in the distance. I keep hoping that we're going to get to these flashing lights lined up along an area as a warning to keep off the hot lava. Up ahead, a pair of lights are coming toward us, a couple of hikers coming back from our intended goal. As we meet and greet, we try to get a little understanding of what we should expect for the rest of our trek. They tell us the lava flow was great, it is hitting the water and the glow is amazing. Just keep on the path, then as you pass the seventh beacon, it's only another 3 miles beyond the park boundary. It's not marked but just head further east and towards the ocean. They only had two problems, not enough water, and a hard time finding the flow beyond the last beacon. It took them 5 hours to get there. Now it's time for a reality check. We headed off on this trip with minimal information. We did not bring a lot of water. It's 10:00 at night, at best, we might make it to the flow and back by 5:00 or 6:00 in the morning. Each beacon we reached was an accomplishment, now there are five more beacons to accomplish. Then there is a no-beacon land. At night. Do we have enough batteries? It took us two hours to get back to the car. We made it home around three o'clock. We're exhausted.